There isn't great RV parking in Chichen Itza either. The Piramide Hotel has been hosting RV caravans since the 1970's, however over the years they have sold off most of the original property and are now left with a narrow spot of land by the road in front of the hotel. Not much to see on the toll road between Merida and Cancun. Yesterday's drive, 130 kms (81 miles). We arrived at the Piramide Hotel around 11:00am and got ourselves squeezed in to the parking area. There are no hookups... it is dry camping. 200 pesos ($14.00 CAD, $11.00 USD) per night, which is a bit pricey for a dry camping parking spot, however you do have use of the hotel pool. Gabriel, the owner of the Mexico RV Caravan company surprised the group with lunch at the popular tourist restaurant across the street, the Pueblo Maya. 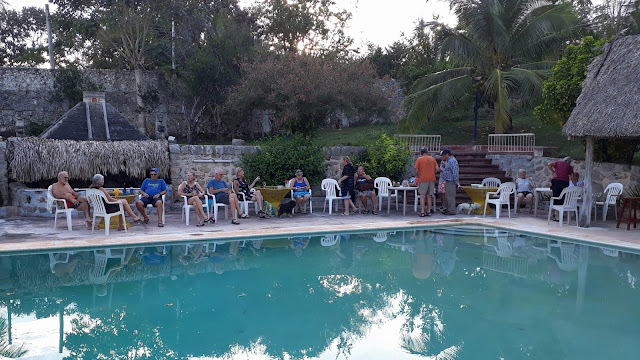 The place is designed for the tour buses that come to Chichen Itza, but it's got good food and good service at a reasonable price. There are something like 22 included meals out in the price you pay for this tour, however Gabriel is very consistent at adding extras! Our group, out for another meal. They have Mayan specialties, as well as "international" fare such as hamburgers and chicken nuggets! Three ladies came out and did an odd dance that included balancing bottles of beer on their heads. We had a free afternoon, which was nice for the people who wanted to take advantage of the swimming pool. Ruth and I played some more backgammon, and went for a walk through the small town of Piste. Then, we joined the rest of the group for happy hour. Happy hour by the pool. Temperatures are warm... highs of 33C (92F), and lows overnight of about 19C (66F). Busy touring day today, as we are off to see the Chichen Itza ruins at 8:00am this morning, hopefully before all the tour buses arrive from Cancun! Then and another buffet lunch and swimming at the Ik Kil cenote. I think this dance with the beer bottles must be part of some form of ballet historico. I saw it last year in Todos Santos, Baja during their 20th anniversary Festival del Arte. Only it wasn't just one bottle...some had entire trays! Costumes were similar, though. That dance is ridiculous. They do it just for tourists, I don't know what they're assuming, nothing to do with authentic folkcloric dances. Thank you for your posts Kevin and Ruth, loving it. These ladies also did it with a tray that had a bottle on it as well as some shot glasses. We have a Mexican friend that would also do a dance with a bottle on his head. Everyone looks happy and relaxed. Your lunch looks yummy. I think everyone is pretty much relaxed now that they have the first month in Mexico under their belts. Lunch was delicious. I remember that restaurant from travels there last year...they did have good food. I was amazed to see the ruins. Someone said 'earth is nothing but a graveyard.' It made me think of eons of things that have died on earth including civilizations...nothing but ruins left and paintings for us to ponder what life was like long ago. I also remember those small shrubbery trees...I had expected tall trees with huge canopies and lots of tropical flowers. We only saw a bit of flowers and tall trees in developed areas. Yes, the ruins are amazing and they sure do make you think about what life was like back then and how on earth they were able to build this structures so precise that at certain times of the year with the sun shining on them that they do some spectacular things! You are right the scenery isn't very exciting in the Yucatan, except in the built up areas. Pool looks refreshing and food looks good. Enjoy your relax time. Interested in seeing 5he ruins tomorrow. Both were enjoyed by the group. The pool area is really nice and relaxing. Gabriel certainly knows how to keep his customers happy or in a good mood with his surprise lunches and dinners! “Freebies” are always a good thing especially when it’s done so well and unexpectedly. Never seen a dance with the beer bottles. Interesting. Gabriel is known for throwing in some surprises. He definitely knows how to look after people. Every state and región has its own dances. The dance in the picture is called Jaranas. Originally danced in vaquerías or when they branded cattle on the haciendas. Juan's group used this and other dances from Yucatán. Yes, thanks for the clarification on the dance. We went to that same restaurant and were rather insulted by what we took to be a degrading activity. Goes to show we should not assume!